God further said to Abraham: “As for your wife Sarai, do not call her Sarai; her name shall be Sarah. I will bless her, and I will give you a son by her. Him also will I bless; he shall give rise to nations, and rulers of peoples shall issue from him.” Abraham prostrated himself and laughed as he said to himself, “Can a child be born to a man who is a hundred years old? Or can Sarah give birth at ninety?” Then Abraham said to God, “Let but Ishmael live on by your favor!” God replied: “Nevertheless, your wife Sarah is to bear you a son, and you shall call him Isaac. I will maintain my covenant with him as an everlasting pact, to be his God and the God of his descendants after him. As for Ishmael, I am heeding you: I hereby bless him. I will make him fertile and will multiply him exceedingly. He shall become the father of twelve chieftains, and I will make of him a great nation. But my covenant I will maintain with Isaac, whom Sarah shall bear to you by this time next year.” When he had finished speaking with him, God departed from Abraham. One of my favorite characters in the entire Bible is Saint Peter. Saint Peter had a lot of mistakes. He committed a lot of blunders. I like Saint Peter not because I am superior to him. I like Saint Peter because like him, I have a lot of errors, a lot of blunders, a lot of mistakes. Saint Peter was a man of doubt. He did not understand everything that God did in His life. He failed in His test of faith. 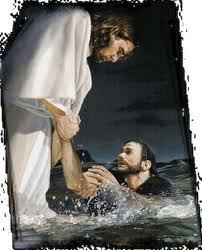 He sank in the waters, and he even denied Jesus Christ three times. But despite all these weaknesses and mistakes of Saint Peter, God loved him. Jesus Christ even made him the rock, the foundation of the Church. With all my blunders and mistakes, I can say that God loves me, too. And so we rejoice today with Saint Peter, the victory of his faith, the victory that he proclaims, that Jesus Christ is indeed the Son of God. And we celebrate, not because of Saint Peter, but because of the One who made this Feast possible - our Lord God. My dear brothers and sisters, all of us fail in our test of faith. But like Saint Peter, when we are filled with the Holy Spirit, we can also profess and say to Jesus Christ, 'You are the King, the Messiah, the Son of God'. Amen.